"Louis Pearl has been thrilling audiences around the world for decades and now brings the art, magic, science and fun of bubbles to a stage near you. From square bubbles, bubbles inside bubbles, fog-filled bubbles, trampoline bubbles to flying UFO bubbles and even people inside bubbles, this wondrous 75 minute show guarantees shrieks of laughter and gasps of amazement from all ages. 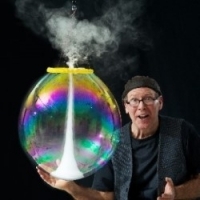 With infectious enthusiasm, The Amazing Bubble Man explains some fascinating facts about bubbles, bringing science to life and into the realm of fun. As well as exploring the dynamics of bubbles, the show combines breathtaking art, a diversity of music, non-stop comedy, ingenious sets and lighting, plenty of audience participation and enough spellbinding bubble tricks to keep every child and adult mesmerised. Step inside the riveting world of bubble-ology and let your spirits soar as high as the bubbles!"